Have you ever thought that how to design embroidery patterns then in this inscrutable you are going to learn it. Firstly you are going to need an efficient embroidery machine that can easily handle complex designs. Once you have your equipment in order you are all set to think about the design aspect of your business. When you are creating the design with the help of a software then you have to import the image for digitizing and it can be done by using the software’s auto feature or by manually converting the image into an embroidery design by telling the software about the stitches that which to use. It is called manual punching you can also use the combination of both. Software makes the how to design embroidery patterns a really easy thing! You can easily select everything from basic software. Everything that you need! Sizing, lettering, editing and the list goes on. Therefore, if you are not willing to create your own embroidery designs or you want to add your own flare to a design then you can easily do it as you can find billion of embroidery designs on the internet. And, if you are thinking that how to design embroidery patterns by hand then no worries! You can easily design embroidery pattern by hand all you need is a little practice and great dedication. 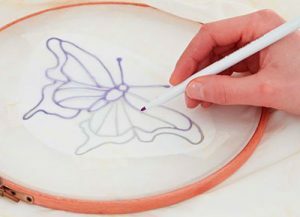 Hand embroidery is a great way to create beautiful imagery floss designs. So, for this purpose, you first need to create an outline of the design while creating the outlines keep in mind that you will be converting these pencil lines into embroidery thread later so it is essential for you to consider closeness and thickness of lines and how this will be translated later on. Once the outline is ready you’ve to transfer the image into the fabric however, there are several methods for that and using the carbon paper is probably the simplest method of transference. All you have to do is to place the carbon paper between your paper outline and your fabric and then just easily trace it. Now, you have to show the magic of your fingers by playing with the threads by just simply stitching it with your favorite color threads! We hope that from this basic inscrutable about how to design embroidery patterns you surely have learned something. Our creative and dedicated artists have complete knowledge about how to design embroidery patterns and they can do any complex or simple design with ease as they have spent decades working in this field. Contact us right away for tremendous quality services.